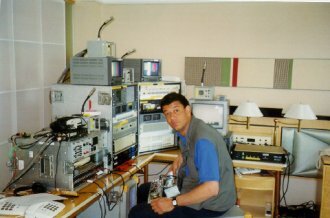 I do general engineering work like the job I did running the engineering side of the ITV Sport unit following the Irish Team at the World Cup, 2002. Here I am fixing a minor problem with one of the Arun Comms Units following the arrival of it in Japan. Thanks to Terry Palmer for providing this photograph and to him and Roy Callow for all the help and support on that trip. I have done maintenance and other engineering work at a number of places as detailed in my CV. I sometimes work at BBC Broadcasting House in Belfast in Room 501, which is their Vision and Sound Maintenance Worskshop.